We'd love to hear from you! Leave a comment below about your favorite place to celebrate the one you love! We all know that sometimes in the midst of doing life together, we forget to celebrate that life. This year, I encourage you to make your marriage a reason to celebrate. 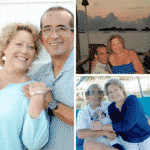 Michael's Tasting Room in St. Augustine, Florida is a fantastic choice to celebrate life and love with your special someone. The “Date Night Menu” at Michael's is a dining experience to be savored, and enjoyed, not rushed. 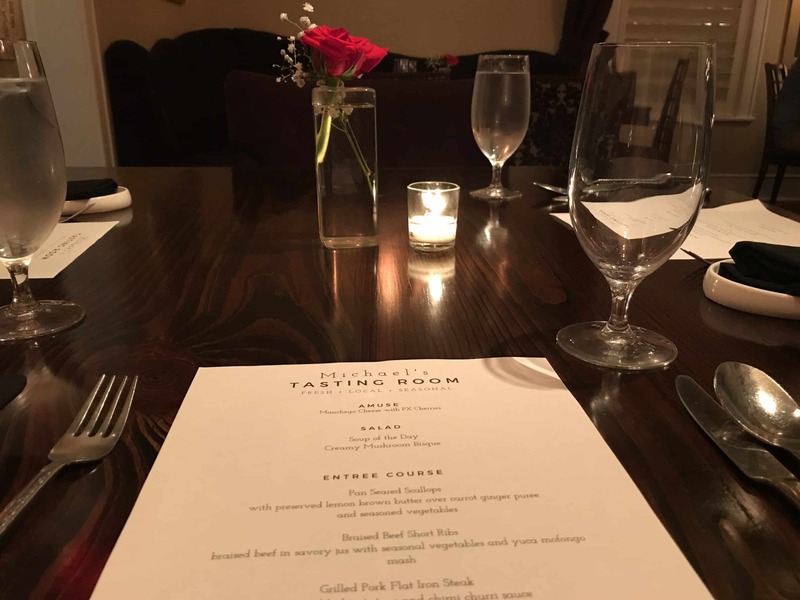 On our recent getaway to St. Augustine, we had a chance to dine at Michael's Tasting Room, and it was a dining experience that we will remember! This post contains affiliate links. When you make a purchase through these links Betsi’s World receives a small commission that helps support this site at no additional cost to you. Walking through the entrance of Michael's Tasting Room in St. Augustine's historic downtown district you are immediately embraced by the intimate feel that permeates this landmark home turned restaurant. As you make your way to your seat, the aromas drifting from the kitchen tickle your nose and create an anticipation for the dining experience to come. Located in St. Augustine's historic downtown, 25 Cuna Street at St. George Street, Michael's is right in the heart of the historic district. Using locally sourced ingredients, Chef Michael Lugo has created a very sensory menu for that special evening out – the Date Night Menu. 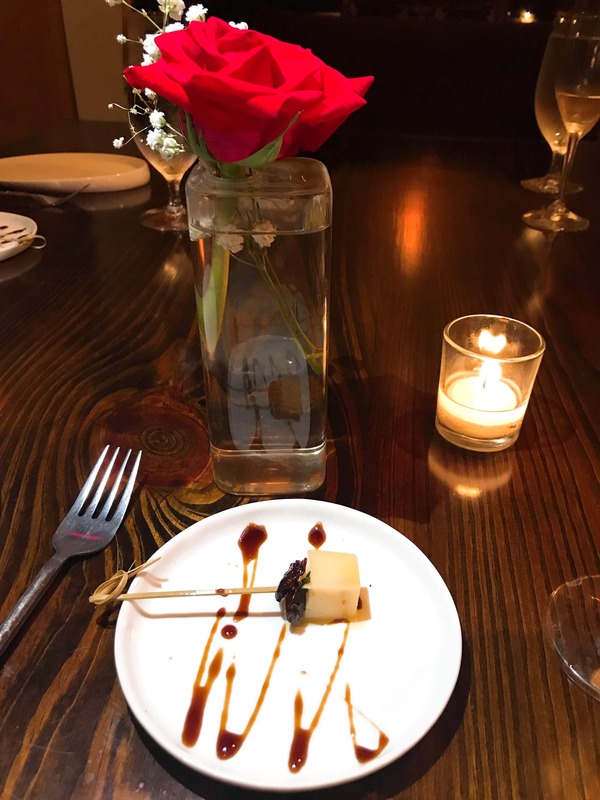 This one-of-a-kind dining experience will begin with an Amuse Bouche, which is Manchengo Cheese topped with a PX cherry and drizzled with a PX reduction. The Amuse Bouche is designed to clear your palate and prepare your taste buds for the spectacular meal to follow. Accompanied by a glass of sparkling wine – just right for toasting that special someone, this complimentary appetizer is the perfect beginning to your evening. Subdued lighting and minimal furnishings add to the intimate feel of the dining room. Our meal began with the Amuse Bouche, designed to clear our palates. There was ample time to chat and laugh as we awaited our next course. 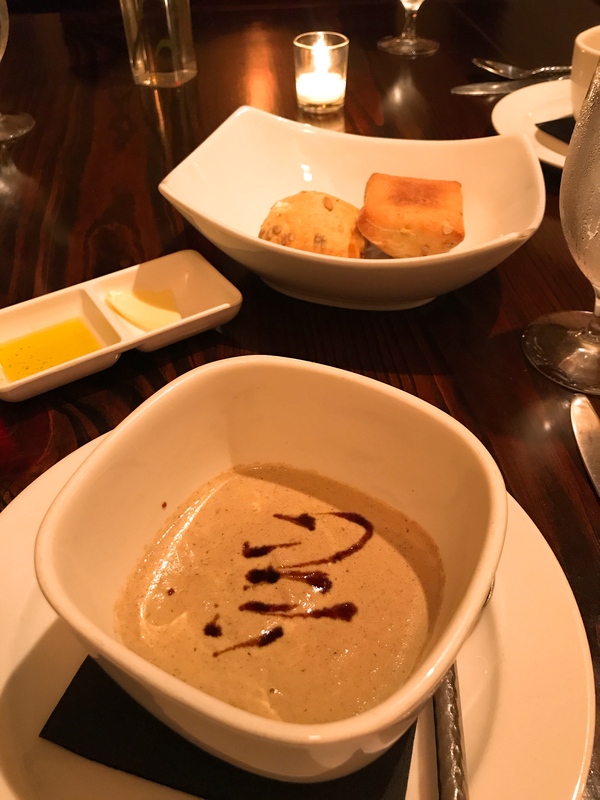 A creamy mushroom bisque, drizzled with a balsamic reduction and accompanied by ciabatta rolls with seasoned olive oil and fresh butter was the next course. The bisque was creamy and delicate, and each bite yielded an earthy taste provided by the mushrooms. The balsamic reduction drizzled on top was a nice compliment to the dish. The entree was spectacular! 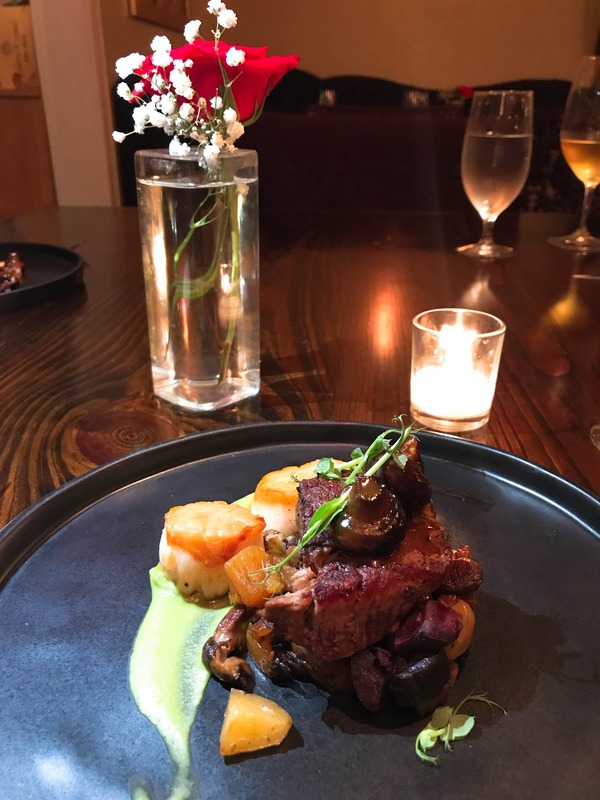 Pan seared scallops with preserved lemon brown butter with a carrot ginger puree and seasoned vegetables, braised beef short ribs in an au jus with a yuca mofongo mash and a grilled pork flat iron steak with marbled potatoes and a chimichurri sauce. Though the entree consisted of three items, they each complimented the other, and the serving was just right – more of a European portion size. The entree was served with a Pazo Cilleiro Albariño wine, which was new to us and was delightful. It was a dry white with a fruity finish that paired well with our meal, tying everything together. To finish off our meal a chocolate brownie bite topped with peanut brittle was served. The was the ideal ending to a perfect, relaxing, and enjoyable dinner. Freshly brewed coffee accompanied the brownie bite, and needless to say, we were pleasantly full. The intimate atmosphere, with soft, diffused lighting, combined with a spectacular, tasty dinner, create a memorable dining experience to celebrate life and love with your special someone. Chef Michael has a passion for creating dishes with a Spanish twist, using as much locally sourced meat, cheese and produce as possible, and sharing those creations with others. His inspiration is his Puerto Rican grandmother, who influenced him from an early age to celebrate with food. When you find yourself in St. Augustine, be sure to carve out time to celebrate at Michael's Tasting Room – after all, life is too short not to celebrate! Like what you’ve read? Subscribe to our blog by adding your email address to the form below. You’ll be the first to hear about our updates & freebies just for subscribers! Subscribe to get our monthly newsletter with updates and freebies just for subscribers!.